Hey, I looked in Information but couldnt find a guide on weight. 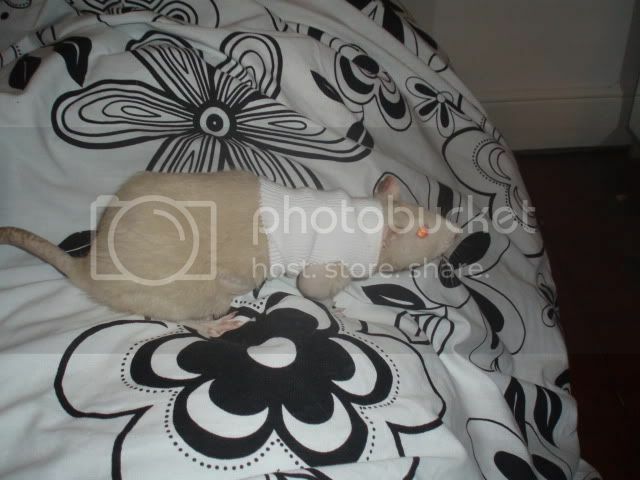 Whats the average weight for a grown rat/ whats to big/ to small etc etc. It completely depends on the rat, my Cheech is 500g and is really slim and toned, but I've seen boys that are about 600g/700g that are really solid, but not fat. If they're squishy and they puddle then they're podgy . My boys are 10 months and all weigh around 400g (lol nearly wrote Kg!) some under some over. The look in great shape but they are quite small compared to other grown ratties I see on the site! They eat like horses and I spoil then quite a bit but there not fatties! Do you think they will continue growing at 10 months? Are they rescues? Seems about right if they are. You would expect breeder rats to be a bit bigger as on the whole they are much longer although it does completely depend on the line. Pet shop rats are bred to be small. Apart from size and pretty colours that's the only things breeding farms select for. I normally expect rescue boys to get between 400 and 600 g, depending on build. But whilst they do get weighed, I actually go on feel. If they are sleek and firm, with nice round tails and nicely covered, they are about right. If they have bingo wings, neck or tummy rolls, or puddle when sitting, they are fat, and if the spine or ribs can be felt, or the tail doesn't look plump and healthy, they are too thin. I've got 23 rats and they are the most amazing combination of shapes, weights and sizes. The boys are generally bigger than the girls, but Rosie is the size of a small mountain and so can be spotted, along with the Great Wall of China, from space. Mei (who is known to her friends as Maybug, because she whizzes around) is teeny tiny - though she eats like a horse. My three pink-eyed whites (known as the Fairies) are tiny, but had a bad start before Purple Vixen rescued them - so I don't expect them to grow very big. I thought my Parkies were going to stay tiny, but they have suddenly filled out and are normal rat sized. Like you, I do spoil my ratties and they probably get more treats than they should. But they also get a lot of exercise, so I don't think it does them too much harm. I agree with Neotoma - as long as they look and feel right, they are probably fine.